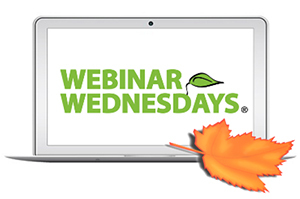 Have a Gourd Time This Webinar Wednesday with an UnBoolievable Webinar! Join us for this week’s Webinar Wednesday to explore tons of bean-based recipes that will support you in your meatless Monday and school garden endeavors. We will break down the health benefits of beans, and how they can supplement for meat products and provide kids the iron and other vitamins and minerals they need to thrive. Then, in November, we will talk to school nutrition directors and chefs to discover how they are working together to create new menu items that are big hits in their cafeterias. This webinar will instruct on what it’s like to advertise, hire and work with a chef in your kitchen, and answer any specific questions you may have in this Q&A style webinar. Chef Jorge Cespedes and Chef Brenda Wattles will discuss how to take all the spookiness out of plant-based protein and make it easy and fun for kids to digest. With valuable tips, doable and tempting recipe ideas, and insights on what is and isn’t working in the industry, this session is going to be all treats (no tricks). Successful completion of the webinar and quiz is awarded 1 SNA CEU, or 1 CPEU for RDs/DTRs. Join a panel of experts for personal stories, advice and answers on how to find a great chef and how to incorporate their culinary skills within your school nutrition team. The webinar will be a live Q&A based on questions participants submit. Submit your questions during webinar registration and during the live webinar. Successful completion of the webinar and quiz is awarded 1 SNA CEU, or 1 CPEU for RDs/DTRs. Join SNA staff to learn about all of the new SNA resources designed to help you and your program. Discussion will explore SNA’s new Learning Center, the new Membership Campaign, new Certificate Level, SNF Scholarships, the upcoming 2019 Virtual Expo, and more! No CEUs are offered for this webinar. Become a Nutrition Hub to feed your students and grow your programs! Participants will hear best practices from two school nutrition directors who have started summer and supper programs in their districts. Successful completion of the webinar and quiz is awarded 1 SNA CEU, or 1 CPEU for RDs/DTRs.